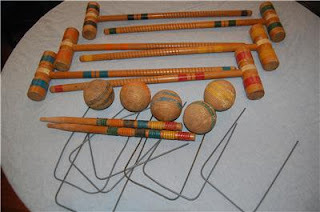 We had a croquet set very similar to this one (ours had hard concrete type balls instead of wooden ones). We'd set it up in the side garden and play with our friends, it was a lot of fun. Posted by Karen at 3:27 p.m.